As the ‘80s and ‘90s promoted agricultural diversification in Alberta, many farming businesses today are a direct outcome of this provincial ‘encouragement’. Elk Ranching (some call it Elk Farming) has seen its up and downs -as many other industries have- and was shook up but not eradicated by the outbreak of bovine TB in the late 80s, early ‘90s. Entire herds had to be put down, many others under quarantine for a long time, while government vets did the appropriate and necessary tests to return a “clean bill of health” to the producer. At the time, a moratorium was imposed, preventing producers from exporting their livestock to the States, and other Canadian provinces! Eventually, things got better, the health of Alberta elk herds was assessed and improved, and the elk industry survived. Although the stock’s prices are not as high as they were in the ‘90s, a dynamic buy- and- sell process in the elk farming industry is still happening in this province, as proven by the successful Alberta Elk Ranchers Production Sale that took place on February 15 in North Leduc. Farmers attending and telephone and internet bidders placed their bids, and close to 100 animals were bought –and sold! In the Leduc-Wetaskiwin region, there are several elk ranchers. 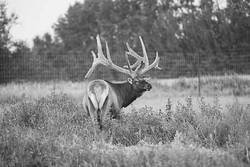 With small herds and large ones of over 100 heads, they deal in meat sales, breeding stock and velvet antlers: there is also a market for trophy bulls with large racks, for the hunting farms in the US, which is not allowed in Canada. The velvet antler cartilage is one of the fastest-growing animal products in the world! Harvested while covered in the velvet ‘skin’ that proceeds the hardening of the antlers, the large and imposing antlers are used for medicinal purposes: they will be processed while frozen and will become capsules or chips to be consumed to treat arthritis and other bone and muscle ailments. Glen Park Elk Farm outside of Calmar is operated by the father- and-son team of Steve and Barry (son) Chernuka. An articulate and knowledgeable elk rancher, Barry Chernuka cites the “aggressive demand for elk meat to supply North American and European markets as a strong factor for the survival and prosperity of the industry”. He adds that this demand puts pressure on the farmers, as the numbers of elk livestock in Alberta have declined somewhat over the past fifteen years. In 1998, the Chernukas allocated 15 acres of their farm to host a few head of elk. In these days, the Alberta government was still dynamically promoting Diversification: the young elk industry then moved from under Fish & Wildlife’s control to ESRD, the Environmental Sustainable Research and Development, and is now under the supervision and shortly will be under the 100% control of Alberta Agriculture. These majestic animals reproduce easily, however they are a bit more challenging to control and handle than cattle, as their nature is ‘wildly’ possessive of their young, and of their territory. Barry shares that his two young children like to go in the rhino (a large ATV) to do chores with dad, and as he believes the industry will remain strong for another 10 to 15 years –at least-, he hopes that one or both of his children will love the farm life and this Agri-business they have developed to want to take it over, after having learned some responsibility and strong work ethics on the farm. But first, he wants them both to get a great education. The Chernukas have now phased out of beef cattle production. With nearly 200 head of elk on a 160- acre farm near Calmar and another property near Wizard Lake, they have laid the foundations of a prosperous business, as this current elk farm is doing well, selling, buying and reproducing successfully each year. In Leduc region, Les Steem and his family have owned Silveron Farms for many years: previously a cattle producer, Les also worked for Leduc County for many years. Through his travels in the County, he was introduced to elk farming by the Vrolyks on their Elk Meadows Game Farm across from Telford Hall, South-west of the City of Leduc. His passion for these majestic animals was ignited, and soon after the establishment of that farm, in the late 80s’, he started construction of his 10-ft fence and his handling facility. The Steems have sold dozens of elk over the past twenty years, even recently exporting animals to Saskatchewan and being an active contributor to the Elk Industry. Near Rolleyview, DJR Elk Farm is operated by Darcy and Linda Zahacy and their two kids, now young adult working on their post-secondary education. They also operate a concession selling elk burgers, jerky and smokies. This progressive and successful business is in part what makes Elk Ranching a viable option for Alberta farmers. www.albertaelkcommission.com is an interesting website full of information. These elk farms are also a part of Eco-tourism. The traffic of international visitors, rural and urban neighbors and school tours never abates, adding to the busy lifestyle of an elk producer!